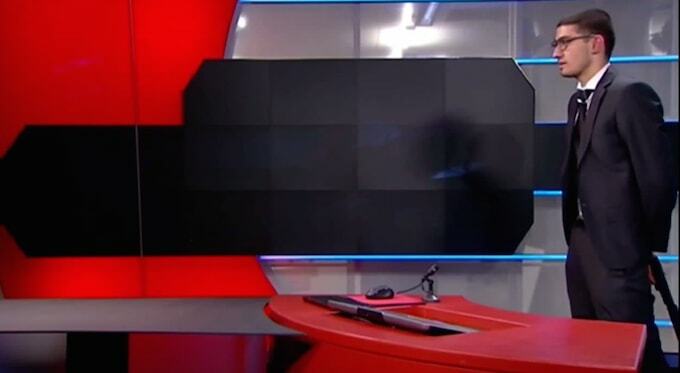 A 19 year old man forced his way into Dutch broadcasting station &apos;Nederlandse Omroep Stichting&apos; (NOS) last night, carrying a pistol that turned out to be fake. The broadcaster&apos;s staff directed him into an unused studio while the building was evacuated. While in the studio the man, named later as Tarik Zahzah from Pijnacker, demanded to be put on air and handed a security guard a note reading "There are five plus 98 hackers ready for a cyber-attack" and "eight heavy explosives placed in the country that contain radioactive material", he then paced and told the guard ""There are major world affairs which we want to bring to the public" before claiming to be working for the security services.